Property Size 2,106 sq. ft. 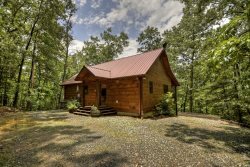 Looking for a mountain cabin? We have just what you need! Grin'Inn Bear It is located smack dab in the middle of the Aska Adventure area. You are only minutes away from the Toccoa River for tubing and fly fishing, Springer Mountain and the Appalachian Trail, and although you feel a world away from everything, you're only about 20 minutes from Downtown Blue Ridge. After a day of outdoor activities, you can come back to the cabin and relax in the amazing hot tub, which seats 6, has color changing lights and has a handy dandy place to connect your phone with an aux cord and listen to some tunes! You may choose to enjoy roasting marshmallows or making smores while sitting around a nice relaxing fire pit area. Inside the cabin is a sauna and a wet bar! That's right, your aching body is going to love you for choosing this cabin! Whether you're a hiker, fisherman, adventurer or just someone who needs a break, check out Grin'Inn Bear It. Amenities: Screened Porch, Hot Tub/Jacuzzi, Dishwasher, Washer, Dryer, Phone, Microwave, Coffee Maker, Satellite TV, Fenced in Yard, Fire Pit Area, Blu-Ray DVD, Pool Table, Wii, Gas Grill, Stereo, Wet Bar and a Sauna!